Microwave squash for 6 minutes, or until soft enough to cut. Halve lengthwise; scoop out and discard seeds. Fill a large baking pan with 1/2 inch water and place squash halves in the pan, cut sides down. Bake until tender, about 40 minutes. Meanwhile, bring a large skillet sprayed with nonstick spray to a medium-high heat. 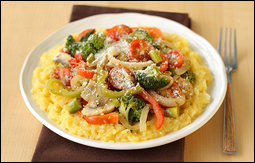 Add onion, bell pepper, mushrooms, broccoli, and asparagus. Drizzle with oil. Cook and stir until veggies have mostly softened, about 5 minutes. Add tomatoes, garlic, and Italian seasoning to the skillet. Cook and stir until tomatoes are hot and garlic is fragrant, about 2 minutes. Remove from heat, and cover to keep warm. Season squash with garlic powder, onion powder, salt, and black pepper. Add cheese wedges, breaking them into pieces, and stir until evenly distributed. Top squash with veggie mixture and Parmesan cheese. Yum! Sausage with apple is a standout combo, so why wouldn't we serve it over one of our favorite pasta swaps? Mmmm! About 20 minutes before squash is done baking, bring a large skillet sprayed with nonstick spray to medium heat. Add apple and onion, and sprinkle with sage. Cook and stir until mostly softened, about 3 minutes. Raise heat to medium high, and add sausage coins. Cook and stir until hot and browned, about 5 minutes. Add garlic, and cook and stir until fragrant, about 1 minute. Remove from heat, and cover to keep warm. Add remaining ingredients to the bowl of squash. Mix thoroughly. Serve squash topped with sausage mixture! 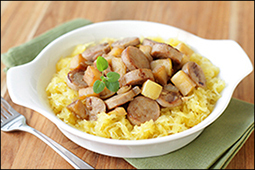 Because your pals need some warm and comforting spaghetti-squash goodness -- click "Send to a Friend" now. November is National Peanut Butter Lovers Month. In case you missed it, check out last Friday's incredible PB finds and recipes!